The small lake running through the Solidaridad Park in Jalisco, Mexico, experienced problems with vegetation due to erosion and scouring. 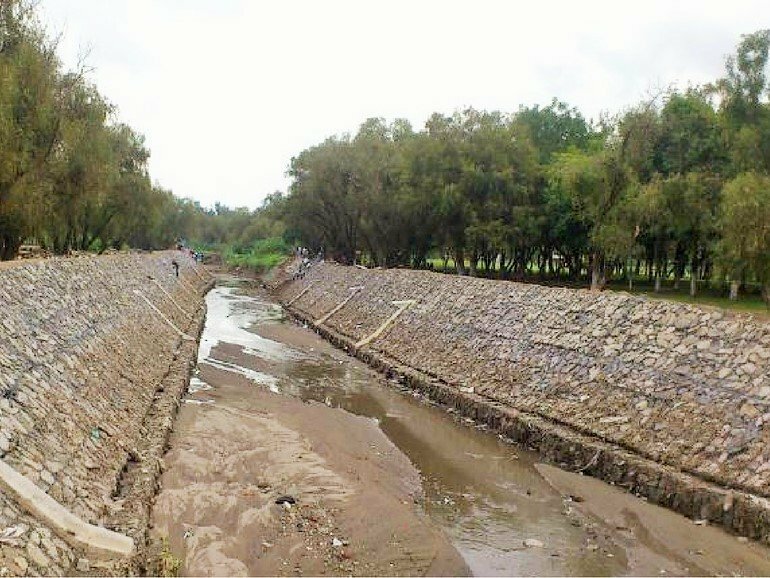 Maccaferri worked closely with the Government of the State of Jalisco to find a solution. The Solidaridad Park is located between the borders of Guadalajara and Tonala, both in the State of Jalisco, Mexico. This is a public space dedicated to recreation, culture and sport that aims to create a close relationship between people, society and nature. It is built on the old Osorio dam and currently only a small lake extends through most of the park. The lake was in poor condition and suffered from multiple problems including excess vegetation, erosion and scouring which combined to cause flooding throughout the park in the rainy season. Maccaferri Mexico cooperated with the Secretariat of infrastructure and Public Works, the executive power of the State of Jalisco, who is in charge of infrastructure development, projects and construction of public works. We know land is expensive. Therefore, our clients often want to manage watercourses and reduce the action of hydraulic erosion and the many other problems resulting from uncontrolled water. Thanks to our experience in hydraulic works, to avoid scouring within the Solidaridad Park we proposed to protect the slopes with Reno Mattresses®. Our double twist wire mesh mattresses were used for the first time over 100 years ago as a hydraulic erosion control intervention. Since then they have regularly been the main component of any hydraulic work structure. Not only are they flexible, so that they conform to the channel and accommodate differential settlements without being damaged, but they also rapidly host vegetation and reintegrate back into nature. The Reno Mattresses are filled with rock at the project site to form flexible and permeable monolithic structures. For more information about our solutions, please contact us.